Corn is such a versatile grain it can be used for many things, including different kinds of sweeteners. The most common sweetener made from corn is high fructose corn syrup (HFCS), which is sometimes called “corn sugar.” You’ll find HFCS in numerous foods and beverages in the United States. High fructose corn syrup is made of either 42 percent or 55 percent fructose, with the remaining sugars being primarily glucose and higher sugars. HFCS is nearly identical to table sugar (sucrose), which is made of 50 percent fructose and 50 percent glucose. Glucose is one of the simplest forms of sugar that serves as a building block for most carbohydrates. Fructose is a simple sugar commonly found in fruits and honey. How does HFCS compare to other sweeteners? Research shows there is little difference between HFCS and any other sweeteners. It adds calories in the same way that sugar, fruit juice concentrate and honey adds calories to foods and drinks. They all contribute the same number of calories per gram. 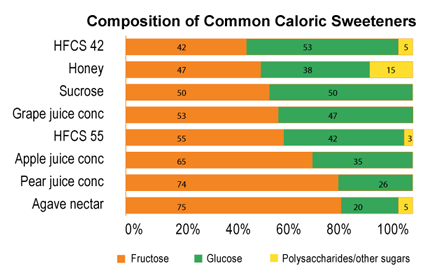 The scientific community and people who know sweeteners and nutrition, agree that HFCS and sucrose are metabolically equivalent and that all sweeteners should be consumed in moderation. Check out this page on Best Food Facts or the link below for more. High fructose corn syrup is not as processed as people believe, nor is “normal sugar” – or sucrose – as pristine as people believe. Both are derived from botanical sources, with sugar coming from sugar cane or sugar beets and HFCS coming from corn. FDA has issued a letter stating that HFCS is a natural product. FDA examined the manufacturing process and recognized the process and steps really didn’t differ much from the processing that takes place with normal sugar from sugar beets or sugar cane (both are processed to make the white table sugar we recognize). This allows HFCS to be classified under the FDA’s definition for natural. For more, check out this page at Best Food Facts. Another resource for HFCS information is sweetsurprise.com.